"Mike's last thoughts, of his wife and children, flew through the back of his skull at four hundred and fifty feet per second"
The last sentence of the first chapter; I was hooked. Mike is...was...Mike Vetter, a CIA agent, likely killed by his own people. His brother, Kurt, himself a former CIA analyst, rushed home from Peru, where he was escaping the tragedy of the sudden death of his wife and daughter. Instead of mourning for his brother, he was thrust into what Mike was unable to complete before his death: getting the data Mike was killed for into the hands of Amanda Carson, a woman Kurt had never heard of, but one of the few people Mike trusted. As soon as he did, Kurt and Amanda were running for their lives, chased by rogue CIA agents that would stop at nothing to complete their mission. 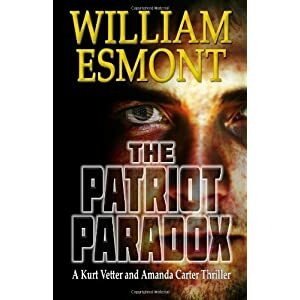 The Patriot Paradox by William Esmont is a fast paced, story driven book; those looking for deep, complex characters will be disappointed. One of the things I liked about the book was the use of technology. Cell phones, voice recognition, powerful search engines, and more; perfect for the conspiracy theorists and Big Brother types among us (sadly, mush of the technology highlighted is likely very possible, and should concern most of us...but that's for a different post!). Though I generally enjoy more character development, I can appreciate a good story, too. This one was good, but could have been better; a bit more hot pursuit, some more close calls for our heroes, or keeping the secret of the threat to world peace a little longer. If you're looking for an in depth mystery, The Patriot Paradox may leave you lacking. But if you need a quick read on a rainy Sunday, or a good vacation book to get lost in, it will be a home run! And since I'm on vacation, I just ordered the sequel, Pressed!